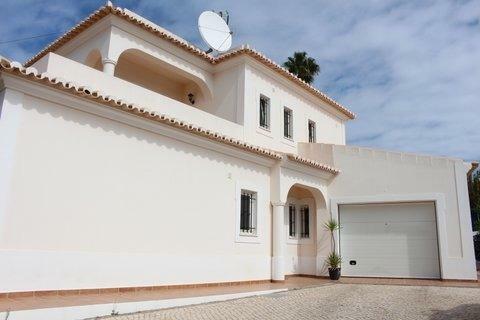 4 bed, 5 bath, detached villa Carvoeiro - Property for sale. Full Description: This modern villa is in the popular Sesmarias area of Carvoeiro less than 5 minutes drive to the resort centre and local beaches. There are local shops and a number of restaurants within walking distance. The ground floor consists of a spacious lounge/diner with a traditional wood burning fire place, a fully fitted modern kitchen, utility room, two twin bedrooms with en-suite shower rooms and a guest w/c. All the principle rooms have access via patio doors to the garden and pool terrace. The first floor has two en-suite bedrooms, one with shower the other a bath. There is a spacious terrace with stairs leading up to the bigger roof terrace with sea and country views to the South and of the Monchique hills to the North. Externally there is a kidney shaped pool (approx 30m2) large terraces, built in BBQ and low maintenance gardens with fruit trees. The driveway has parking for at least two vehicles plus of course the garage. Additional benefits are solar hot water, electric underfloor heating, satellite and cable connections for TV and internet. The villa was constructed by a local family owned business who has built many properties in the area and has an excellent rental history should the owners wish to take advantage of this when not in residence. Carvoeiro has an established reputation as a popular family resort with an increasing number of up market restaurants and shops. There are two golf courses within a few minutes' drive plus a tennis club. For those looking for a full or part time home in Portugal this villa and the area should definitely be considered. Viewing recommended. This listing has been viewed 2815 times.